The Empowering Local Learners (ELL) Project was first established in Port Augusta in 2013 with funding from the Federal Government’s Empowering Local Schools Initiative. Initially the project started with the involvement of four schools, one secondary school and three primary schools. The project has since grown to include all 16 public school and ​pre-school sites in Port Augusta and Quorn. The project is now funded by the Port Augusta and Quorn Partnership with strong support from Flinders University. The project is a collaboration between these 16 sites and the Flinders Centre for Science Education in the 21st Century at Flinders University. 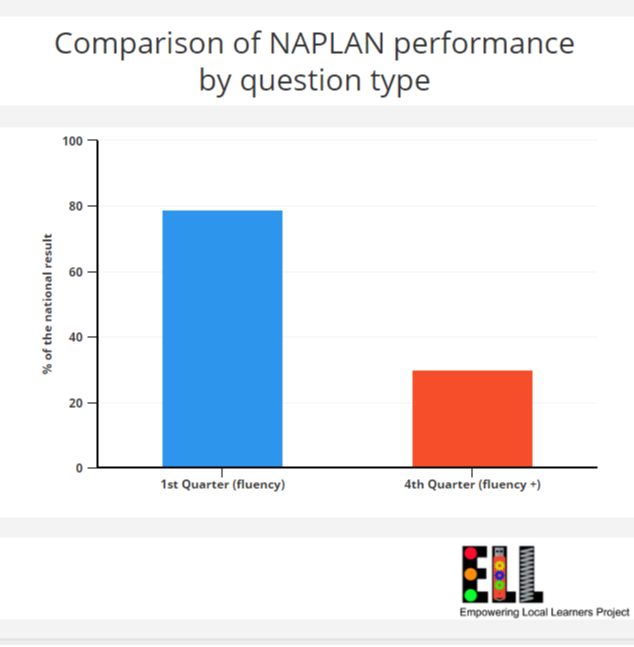 In looking at the national results for NAPLAN numeracy results it was clear that the students we work with compared quite well to national levels with question types requiring the direct application of a procedure. These questions are similar to those over-represented in most maths textbooks and worksheets. Professor Westwell and his team call these 'fluency' questions. However, when looking at non-routine questions, those requiring problem-solving and reasoning skills and the flexible use of mathematical knowledge, our students began to lose pace against national levels of achievement. These are questions that Professor Westwell and his team refer to as 'fluency +' questions, as they still require those fluency skills, but those skills alone are not enough to be able to tackle the question. It became very clear that these more challenging question types should form the basis for our work as a partnership. A focus on developing students executive functions helps to focus students attention towards those learning dispositions that allow them to approach unfamiliar and complex tasks. By helping them to develop the skills to 'stop and think' when encountering difficulty they will be less likely to give up on the task and be more likely to persist with it, to work through those difficulties. The project we are undertaking is ambitious, it aims to improve numeracy outcomes fro more than 2000 children from ages birth to 18 across two towns. It also aims to impact upon the classroom practice of approximately 400 teaching and support staff across 16 sites. Approximately 40 focus teachers have been identified, at least one from each of the 16 sites. Those focus teachers work with teacher researchers and academics (cognitive neuroscientist) from Flinders University twice per term over the course of the year to upskill them in their understanding and application of executive function in the classroom. ​These focus teachers then work with their site leader to determine the best way to then up-skill the other staff in their site. Examples of site level initiatives has included coaching of individual teachers, lesson observations, sharing of practice and presentations made at staff meetings. A numeracy coach has also been employed to manage the project and to support both focus teachers and sites to implement this work. The image above is a depiction of the connections within the project. Each of the four listed groups informs the work of the other three, and their work in turn is informed by those three groups. Therefore this project has evolved extensively over the course of the project as the needs of the sites and the focus teachers evolve. With such diversity in the ages of children taught by the focus teachers and also in the number of years experience each of the focus teachers have had in the project our professional development model has had to be quite diverse. We currently run two days of professional development twice per term for each of the four school terms for most focus teachers, and one day per term for our most experienced focus teachers. The first of the two days is for focus teachers new to the project. Their awareness of executive function and how to apply a focus on it in the classroom is typically quite limited. Therefore the model is one of lesson observation where these teachers watch a lesson delivered. There is discussion beforehand about the lesson and its intention and discussion afterwards about what was seen. There is also time put aside to plan for something they will try in their own class. The second of the two days is for teachers who have had at least one year of experience in the project already. Their understanding of how to apply a focus on executive function in the classroom is much more developed, and they have been implementing it with success. Therefore the lesson observation model is inappropriate, they need to be pushed deeper with their understanding. In their professional development sessions these focus teachers spend much more with a deeper focus on the research and what it may mean for their classroom. They spend much more time in collaborative planning, in sharing their thinking with others and in reporting back on the successes and challenges of the tasks they have been trying. Across the school sites in the partnership one experienced ELL staff member has been identified as a site level leader of the work. They are attending one day of training per term to look at how to best lead this work with the staff in their own schools. In the Empowering Local Learners Project, we are approaching mathematics instruction in a different way to what it has looked like previously. This is not to say that we are not using instructional techniques that have been used previously. There has however been a change in how and when we use various techniques. ​The video opposite explains how we are approaching some of these differently. Since its introduction the Empowering Local Learners project has had significant results for our region. It has been exciting to see these gains not only continue, but also improve over the last few years. There have been dramatic gains in children's perceptions of mathematics, their engagement in lessons and their achievement on diagnostic assessments such as NAPLAN and PAT-M.
Teachers have also seen some significant gains in relation to their own teaching they are reporting substantial increases in confidence with mathematics and with the implementation of high-quality tasks that require deep levels of student thinking. Maths used to be hard and I hated it. Now maths is hard and I like it. The above quote is one from one of our focus teachers.Through this quote it is very clear that through the work of the ELL project, this teacher has fundamentally changed what they see as being the important characteristics of a young person's education. It shows that they have begun to let go of previous, more traditional, teaching practice and have embrace different ways for students to learn. In looking at the gains with the achievement data it became clear to us that after only one year of the project the gains were not really visible in the achievement data despite being evident in the engagement data. However as can be seen in the graphs below the gains in 2015 have been substantial, and these gains have been most substantial for those students who have had a focus teacher for two successive years. Since the project has been introduce we have seen a substantial increase in the number of students who are meeting national minimum standard. These students have struggled significantly with their work in the past and as a result of the implementation of this project almost every student is now meeting the standard. 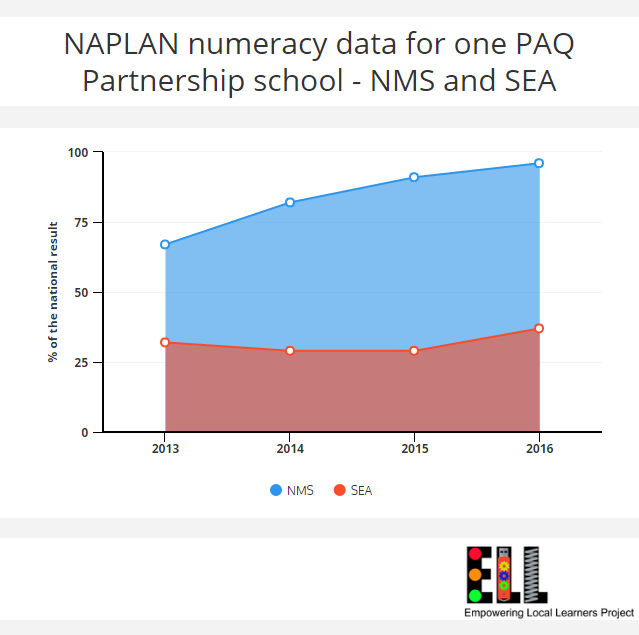 ​Despite having a way to go in relation to the achievement against the DECD Standard of Educational Achievement (SEA) there have been increases in the number of students also meeting this standard, particularly in the last 12 months. Please Note: The results for this school were chosen because they are showing the highest results or the highest growth, but because they approximately represent typical growth across the partnership. The results in other schools may be higher or lower than this but the rate of growth would be about the same. In looking at the data comparing the achievement by question type we can see some smaller and some significant gains. There has been a slight closing of the gap between our schools and national schools when it comes to the routine fluency questions. However our results in this area are also relatively high and these question types have not been the focus of the ELL project. 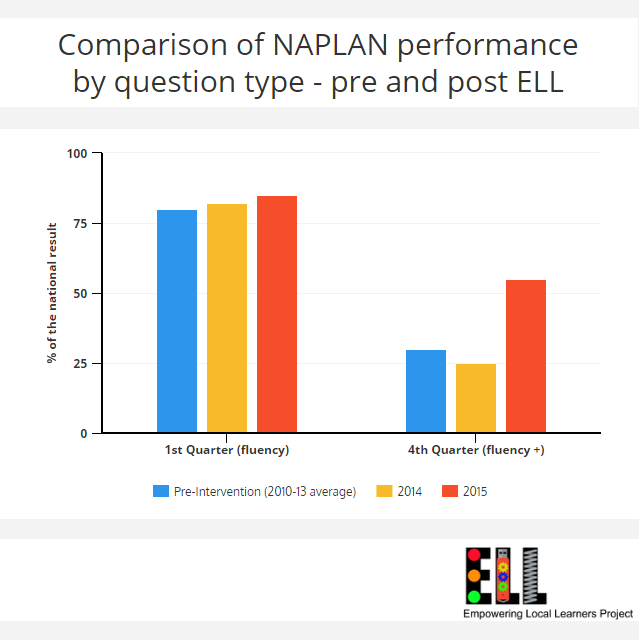 The most significant gains have been in the most complex questions of the NAPLAN test, those in the fourth quarter. In the results of 2015 we can see a dramatic closing of the gap between our schools and the average national result. The achievement of students against thse more complex question types, which have been the focus of the ELL project, has approximately doubled since the start of the project. 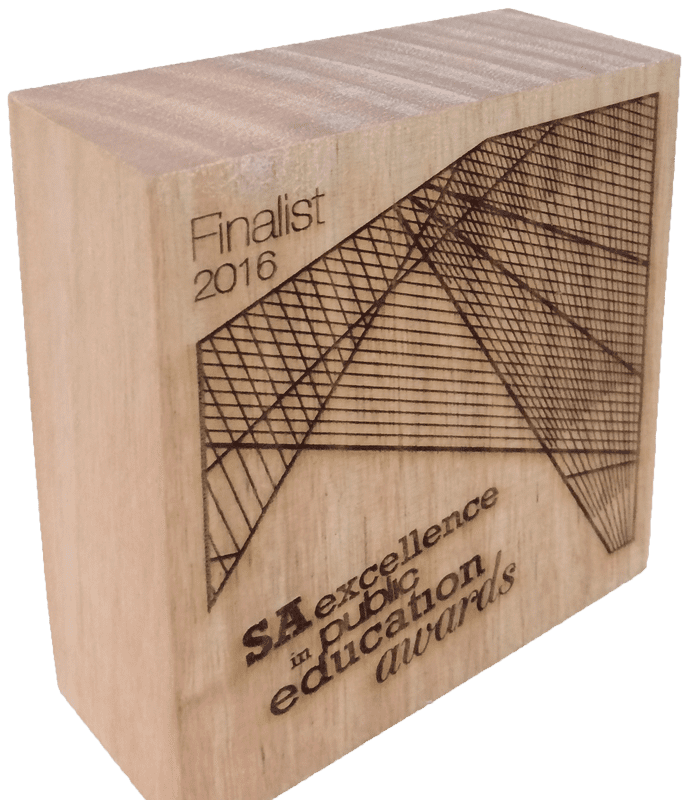 In 2016 and again in 2017 the Empowering Local Learners Project was a finalist in the Excellence in Public Education Awards under the category of Innovation in Practice. ​In both years the project was only one of three finalists. Even though the project did not end up winning this award in either year, the nomination as a finalist in consecutive years is strong acknowledgement of the work that is being done in this project. In 2016 we were invited back to the EPPC conference, this time in Melbourne to present a follow up 20 min workshop (presentation can be accessed from here). Also in 2016 the Empowering Local Learners Conference was one of only a few projects from across the country to be asked to present at the Education Changemakers Educhange Conference. It is a conference known to showcase some of the most innovative ideas from across Australia regarding teacher-led innovation so presenting there was a strong acknowledgement of the work we are doing. In 2017 the project was invited to present at the International Science of Learning Conference organised by the Science of Learning Research Centre (program here). The conference brought together researchers and teachers from across the world to discuss how the research base we currently have can begin to make an impact on a classroom level. With the theme of the conference being "from research to reality" the Empowering Local Learners project was asked to present as it is seen as strong example of how research informed practice can make a tangible impact on a classroom level. A copy of the presentation can be found here.